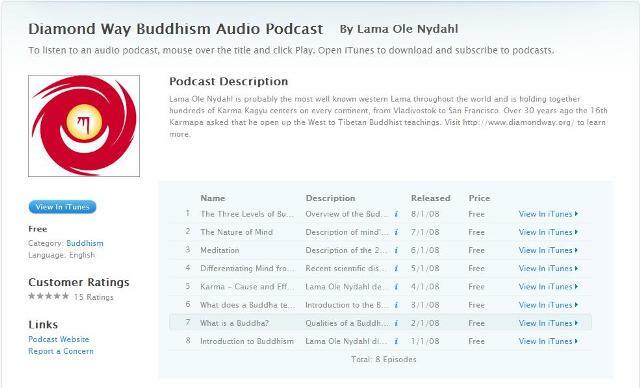 If you’re an iTunes/iPod/iPhone user, why not download this series of free podcasts featuring Buddhist teachings by Lama ole Nydahl? The Diamond Way Buddhism Audio Podcast channel can be accessed here. Overview of the Buddha’s teachings: Cause and Effect, Trust in Emptiness, Energy and Identification. Description of mind’s qualities, its significance, and its potential to change our lives to become joyful, fearless and kind. Description of the 2 main stages of all buddhist meditations, as well as the qualities and results of Diamond Way meditations. Recent scientific discoveries show the brain transforms but does not produce mind. This breakthrough is significant and in alignment with what the Buddha taught. Lama Ole Nydahl demystifies a commonly misunderstood concept with a concise overview of Karma as defined by the Buddha, as well as practical Buddhist methods. Qualities of a Buddha. Manifestation of Buddhas. Cosmology and cycles of the teachings of Buddhas. Lama Ole Nydahl distinguishes Buddhism from other religions and briefly describes the Buddhist view and goal. This entry was posted on Monday, September 27th, 2010 at 10:14 am and is filed under Diamond Way Buddhism, Lama Ole Nydahl. You can follow any responses to this entry through the RSS 2.0 feed. You can leave a response, or trackback from your own site. Wow, isn’t Lama Ole a true Bodhisattva!? Amazing activity, teachings ready to be picked up from space.